Isn't she a babe? My mom. I remember the good and happy times with her. 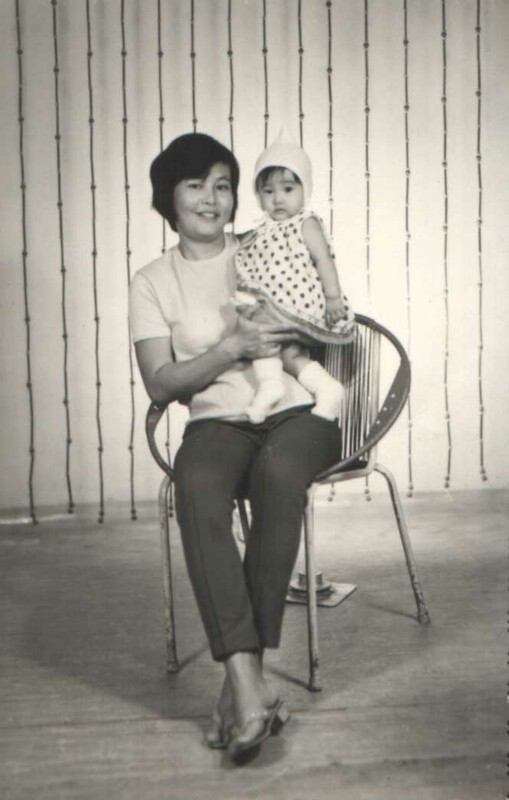 Mom was a stoic and soft-spoken person, a good person who never sought attention or credit for her quiet industry. She was a modern thinker for her time. Our lives were never cluttered with superstitions, archaic rituals or limitations. I owe her a very sane, normal childhood. 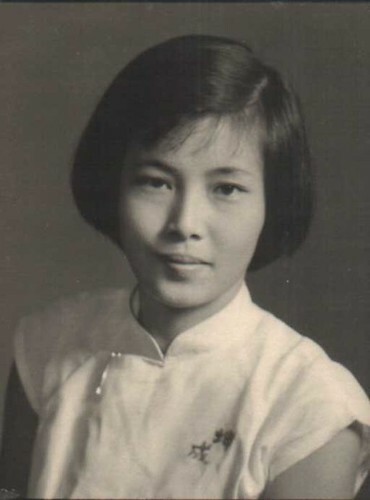 She was a teacher at a Chinese primary school but sent us to learn English and Malay, while she taught us Chinese at home. She and my dad instilled in us a love of books from an early age. They also encouraged art, drawing and painting. She herself was creative. She could make her own dresses, and craft objects out of almost anything. Mom had home skills I will never have. And she was able to make plants and flowers bloom abundantly. We were lucky that she was a pretty good cook - oh the divine braised pork knuckles, wonderful soups and stirfries. Simple vegetables became delicious things. And til today, no dim sum restaurant can deliver phoenix claws as good as the way she did them. Every school day, she was up at the crack of dawn to prepare breakfast - half-boiled eggs with a splash of soy and dash of pepper - so we could catch the school bus on time. And every day, after work, she would come home and prepare dinner. How tiring that must have been. I am very grateful too, that she was a liberal mom when it came to pets. Oh the menagerie we had! All kinds of dogs, birds, fishes, rabbits, terrapins and tortoises, a flurry of chicks, even a pig-tailed macaque ("Beruk") and three monkeys. Oh, and an owl that flew into our living room and stayed a few weeks. That was cool. I also remember many holiday trips. No fancy overseas destinations, but every one of them was an adventure. Penang, Malacca, Port Dickson, Genting and Cameron Highlands. Annual road trips to grandma's in Kuala Lumpur, and dad's hometown in Sitiawan (Perak, Malaysia) took us through many little towns along the way. Mom was Dad's navigator, always. Like many who have been through tough times and the war, Mom was frugal. Frugal to a fault. She never spent a single cent on herself, squirreling away funds and investing for the future, for us. We learned the importance of thrift and delaying gratification, but never greed. She also stressed the importance of filial piety but never pressured us to take care of her. She made sure she was not a dependent burden. Money that I gave her after I started working was given back to me, untouched, when I was going through a jobless patch. My mom was very protective of us but she respected our judgement and gave us freedom to choose our path in life - be it a faith she did not follow herself, or studies and vocations that would take us away from her side. She worried about us constantly, but tried not to nag too much. This is my little shrine to you, mama. My best tribute to you is still to be a better, kinder and wiser person. Illnesses in the last few years have made your life unfairly painful. We nearly lost you six months ago, but you pulled through to spend with us one more Chinese New Year and your birthday last Thursday. And on Saturday night, 11 April, you left. We miss you terribly (Pa is especially sad and lost), but we know you are in a happy place. A great eulogy. I know your mama will be proud of you, and be comforted that she's in a far better place now. Condolences from me and A. Please take care..
Condolences to your family. Do take care. I've been an avid (albeit silent) reader of your blog for a year now. I'm very, very sorry for your loss. Hope you and your family will be alright. It hurts alot to lose a family member..
My sincere condolences. Hope you and your family pull through this. Take care. Cat, although i do not know your mother, but after reading through all these, she is a wonderful mother, and it is nice to see you recap all the good things about her. I'm sure your mother will not want you all to be sad over her, we mourn each passing because there is love, she will want you all to be strong and stay happy. I'm sorry for having hear that. Be strong through this rough period it's not gonna be easy. My sincere condolences. my condolences. I have also been a silent reader of your blog. Always enjoyed your writing. Please do take good care, and stay strong. Moms always have a special place in our hearts. Hope the memories of her will pull you through. My condolences to you and your family. Take care. Sorry to heard about your loss. I am sure your mom will continue to live on in your mind and your heart. take care. Our deepest condolences, my dear, to you and your family. Her legacy will be strong. i've lost a loved one not too long ago as well.. But i've been seeking so much peace from your blog post, and the wonderful photos..
Do keep it up, and I'm sure you'll find the strength to carry on, knowing that you have your loyal readers behind you, and how your blog brings joy to them. My most heartfelt thanks to everyone for the solace and kind words. A big hello too, to those who are commenting for the first time. Yes, mothers will always have a special place in our hearts. We hold her even dearer now. It's a tough time but if anything, we should live even more fully in her honour. I will continue to blog as usual. Like some of the rest, I have been a silent reader. Stay strong and be happy, she will be watching over you and your little ones. My deepest condolences to you and your family. I'm sure your mom will live on in your heart. Take care! What a beautiful life retold and cheers to celebrating her soild life. What a beautiful tribute and what a wonderful person she was. I'm so very sorry for your loss. Do take care. i'm yet another silent reader.. very sorry to hear about your loss, my deepest condolences to you and your family. please take care! Thank you all again, including silent readers. Your support is much appreciated! Some of you have also lost close ones recently - my sympathies too. My condolence to you on the demise of your dearest mum, she looks beautiful in the first pic; I last read that you brought your daughter to see her last month or so. You must have missed her a lot. Take care. I'm very sorry to hear your loss, condolences to you and your family. I'm glad you have so many fond memories to remember of your wonderful mother. I'm very sorry to hear that. It's not easy to lose anyone so close to your heart. I know it, because tomorrow is my dear grandma's 3rd anniversary & it still hurts. Be strong my dear. Thanks very much, Jencooks, noobcook and SIG. I saw my mom last at Chinese New Year. Missed her birthday though. She'd actually seemed to be getting stronger in the last few days, and then she just went. SIG, my sympathies too, I remember reading about your grandma. It was so touching. Condolences to you. God remembers; and may you be comforted. It's hard leting go of our loved ones, one who loved us so much. Sorry to hear about your mum. My condolences. You wrote very beautifully of her and I teared reading it. i'm sorry about your mom,my deepest condolences. Beary, Esther, Anonymousx2: thank you all very much for your comforting words.